Protected by the 3-mile sandbar, Bayocean Peninsula, the Tillamook Bay is a 6-mile inlet on the Oregon coast with calm waters near one of the Oregon coast’s rare backcountry camping areas (Bayocean Peninsula), the fishing community of Garibaldi, and the small farming and dairy community, Tillamook. 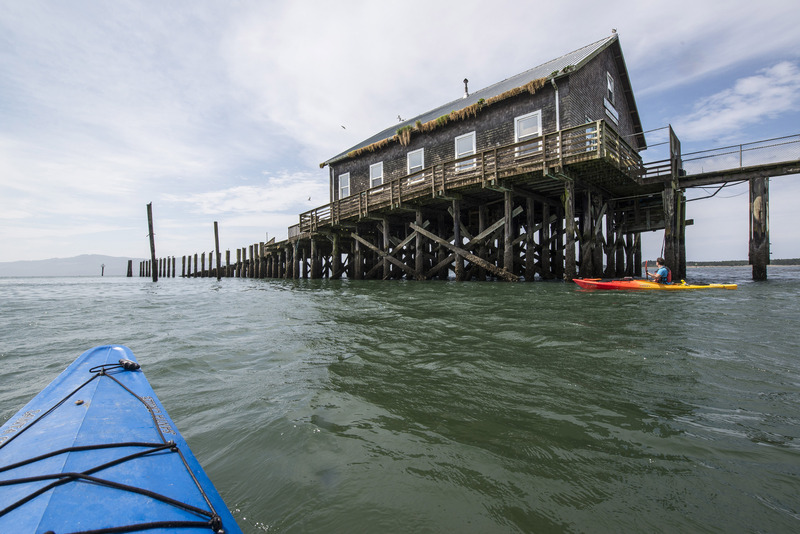 Thanks to Bayocean Peninsula and the North and South Bar Jetties, the waters of Tillamook Bay are calm enough for waterborne adventures by kayak in one of the nation’s 28 Estuaries of National Significance. Like much of the Oregon coast, the shoreline features bite-sized seastacks of the kind that make Cannon Beach and the Samuel Boardman Scenic Corridor such amazing outdoor destinations. Known to locals as The Three Graces, due to their good luck symbolism for mariners crossing the historically tumultuous Tillamook Bay Bar, this small cluster of stone outcroppings to the northwest of Garibaldi are best navigated by kayak. Less than 2 miles from the Garibaldi marina, the kayak to The Three Graces is a great afternoon outing when the tides are right. Be sure to put in about 30 minutes before the peak of high tide and return when the tide shifts in. The inlet into Tillamook Bay is narrow, and currents can reach speeds of 5 miles per hour, pushing unaware kayakers out to sea. If you find yourself fighting the current, don’t; look instead for eddies near shore, where water stalls just like it would on a river. Composed of sandstone formed between 20 and 30 million years ago, tectonic forces ultimately pushed The Three Graces to their present elevation at sea level. With the high tide, The Three Graces are navigable by kayak and a notable destination for waterfowl and the formation’s photogenic appearance. When the tide is out, the Three Graces offer tide pools and are accessible by foot. The Garibaldi marina offers boat rentals, but it does not offer kayaks. Guiding services in the area offer kayak rentals with a guided voyage. Parking is convenient to the marina and abundantly available, and the put-in is just across Mooring Drive. Garibaldi is a busy fishing community, so be aware of fishing vessels in Tillamook Bay. While camping on Oregon beaches is largely legal, city ordinances can complicate this; however, the Bayocean Peninsula is free and clear for backcountry camping should you desire to make this an overnight excursion.